The Olympic Games (French: Jeux olympiques) are an important international event featuring summer and winter sports. Summer Olympic Games and Winter Olympic Games are held every four years. Originally, the ancient Olympic Games were held in Ancient Greece at Olympia. The first games were in 776 BC. They were held every four years until the 5th century AD. The first "modern" Olympics happened in 1896 in Athens, Greece. Athletes participate in the Olympics Games to represent their country. Over time the Olympics have become bigger. In old times, women were not allowed, but now there are women's events. The Winter Games were created for ice and snow sports. The Paralympic Games were created for athletes with physical disabilities. As well, the Olympics became bigger with the addition of the Youth Olympic Games for teenage athletes. World War I and World War II led to the cancellation of the 1916, 1940, and 1944 Games. As the decision-making body, the International Olympic Committee (IOC) is responsible for choosing the host city for each Olympic Games. The IOC is also responsible for choosing what sports are in the games. The celebration of the Games includes many rituals and symbols, such as Olympic flag and torch, as well as the opening and closing ceremonies. The first, second, and third-place finishers in each event receive, respectively, gold, silver, and bronze medals. The Olympics of Ancient Greece featured mainly athletic but also combat and chariot racing events. During the Olympic Games all struggles among the participating city-states were postponed until the games were finished. The origin of these Olympics is shrouded in mystery and legend According to legend, it was Heracles who first called the Games "Olympic" and established the custom of holding them every four years. The most widely accepted date for the beginning of the Ancient Olympics is 776BC; based on inscriptions of the winners of a footrace held every four years starting then. The Ancient Games featured running events, a pentathlon (consisting of a jumping event, discus and javelin throws, a foot race and wrestling), boxing, wrestling, and equestrian events. The Winter Olympics were created for snow and ice sports that were not part of the Summer Games. Figure skating (in 1908 and 1920) and ice hockey (in 1920) were Olympic events at the Summer Olympics. At the 1921 Olympic Congress, in Lausanne, it was decided to hold a winter version of the Olympic Games. A winter sports week (actually 11 days) was held in 1924 in Chamonix, France. The IOC ruled that the Winter Olympic Games be celebrated every four years on the same year as the summer games. This pattern continued until the 1992 Games in Albertville, France. After this, beginning with the 1994 Games, the Winter Olympics were held on the third year of each Olympiad. Starting in 2010, Youth Games help to develop young athletes for the Olympic Games. Athletes between the ages of 14 and 18 compete. The Youth Olympic Games were created by IOC president Jacques Rogge in 2001 and approved during the 119th meeting of the IOC. The first Summer Youth Games were held in Singapore from 14–26 August 2010. The first Winter Games was hosted in Innsbruck, Austria, in 2012. These Games are shorter than the Olympic Games. The summer version will last twelve days and the winter version will last nine days. The IOC will allow 3,500 athletes and 875 officials to take part at the Summer Youth Games. 970 athletes and 580 officials will take part at the Winter Youth Games. The sports to be played will be the same as at the Olympic Games. The Olympic logo also known as the Olympic rings, consists of five intertwined rings and represents the unity of the five inhabited continents (America, Africa, Asia, Australia, Europe). 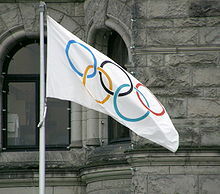 The colored version of the rings—blue, yellow, black, green, and red—over a white field forms the Olympic flag. The flag was adopted in 1914 but flown for the first time at the 1920 Summer Olympics in Antwerp, Belgium. The flag has since been flown during every Games. The Olympic motto is Citius, Altius, Fortius, a Latin expression meaning "Faster, Higher, Stronger". In the early 20th century, many Olympic athletes began using drugs to improve their athletic abilities. For example, the winner of the marathon at the 1904 Games, Thomas J. Hicks, was given strychnine and brandy by his coach. The only Olympic death linked to doping happened at the Rome Games of 1960. During the cycling road race, Danish cyclist Knud Enemark Jensen fell from his bicycle and later died. A coroner's inquiry found that he was under the influence of amphetamines. By the mid-1960s, sports federations were starting to ban the use of performance-enhancing drugs. The IOC did likewise in 1967. The IOC created the World Anti-Doping Agency in 1999. The IOC-established drug testing regimen (now known as the Olympic Standard) has set the worldwide benchmark that other sporting federations around the world attempt to emulate. The first Olympic athlete to test positive for the use of performance-enhancing drugs was Hans-Gunnar Liljenwall, a Swedish pentathlete at the 1968 Summer Olympics, who lost his bronze medal for alcohol use. By 2016, the Olympic Games will have been hosted by 44 cities in 23 countries. The United States has hosted four Summer and four Winter Olympics, more than any other nation. Among Summer Olympics host nations, the United Kingdom has been the host of three Games, and hosted its third Olympics in 2012 in London. Germany, Australia, France, and Greece are the other nations to have hosted the Summer Olympics twice. Among host cities, only Los Angeles, Paris, Athens and London have played host to the Olympic Games more than once, with each holding that honor twice. With the 2012 Games that took place in London, the British capital holds the distinction of hosting the modern Olympics Games three times, more than any other city. Paris will be the second city to host the modern Olympics Games three times in 2024, while Los Angeles will be the third city in 2028. 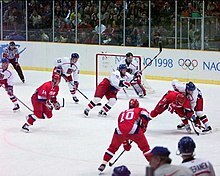 In the Winter Olympics, France has hosted three Games, while Switzerland, Austria, Norway, Japan, and Italy have hosted twice. The most recent Games were held in Pyeongchang, South Korea's first Winter Olympics and second overall. The next Winter Games will be in Beijing, China in 2022, which will be the first time this nation has hosted. And Youth Olympic Games in a separate list. ↑ Swaddling, Judith (2000). The Ancient Olympic Games (2 ed.). Austin: University of Texas Press. p. 54. ISBN 0-292-70373-2. OCLC 10759486. Retrieved June 6, 2009. ↑ "Olympic Games" (registration required). Encyclopædia Britannica. Retrieved 2009-04-29. ↑ "Ancient Olympic Events". Perseus Project of Tufts University. Retrieved 2009-04-29. ↑ However, Theodosius' decree contains no specific reference to Olympia (Crowther (2007), p. 54). ↑ 10.0 10.1 "Histoire et évolution des Jeux olympiques". Potentiel (in French). 2005. Retrieved 2009-01-31. ↑ 12.0 12.1 Young 1996, p. 14. ↑ Young 1996, p. 31. ↑ "Much Wenlock & the Olympian Connection". Wenlock Olympian Society. Retrieved 2009-01-31. ↑ 20.0 20.1 "Rugby School motivated founder of Games". Sports Illustrated. Reuters. 2004-07-08. Retrieved 2009-02-04. ↑ "Athens 1896". The International Olympic Committee. Retrieved February 8, 2010. ↑ 26.0 26.1 Young 1996, p. 128. ↑ "1896 Athina Summer Games". Sports Reference. Retrieved January 31, 2009. ↑ "St. Louis 1904 — Overview". ESPN. Retrieved 2009-01-31. ↑ "1906 Olympics mark 10th anniversary of the Olympic revival". Canadian Broadcasting Centre. 2008-05-28. Retrieved 2009-01-31. ↑ "Chamonix 1924". International Olympic Committee. Retrieved 2009-01-31. ↑ "Winter Olympics History". Utah Athletic Foundation. Retrieved 2009-01-31. ↑ "Rogge wants Youth Olympic Games". BBC Sport. 2007-03-19. Retrieved 2009-02-02. ↑ Rice, John (2007-07-05). "IOC approves Youth Olympics; first set for 2010". USA Today. Associated Press. Retrieved 2009-02-02. ↑ "Innsbruck is the host city for the first Winter Youth Olympic Games". The Vancouver Organizing Committee for the 2010 Olympic and Paralympic Winter Games. 2008-12-12. Retrieved 2009-03-30. ↑ "IOC to Introduce Youth Olympic Games in 2010". CRIenglish.com. 2007-04-25. Retrieved 2009-01-29. ↑ "IOC session: A "go" for Youth Olympic Games". International Olympic Committee. 2007-07-05. Retrieved 2009-02-02. ↑ Wade, Stephen (2007-04-25). "No kidding: Teens to get Youth Olympic Games". USA Today. Retrieved 2008-08-27. ↑ Michaelis, Vicky (2007-07-05). "IOC votes to start Youth Olympics in 2010". USA Today. Retrieved 2009-02-02. ↑ Olympics.org, "Factsheet: The Olympic Movement"; "The Olympic Movement". Retrieved 2012-7-27. ↑ "Roles and responsibilities during the Olympic Games" (PDF). International Olympic Committee. February 2008. pp. 1–2. Retrieved 2009-05-02. ↑ "For the Good of the Athletes". The Beijing Organizing Committee for the Games of the XXIX Olympiad. 2007-10-31. Retrieved 2009-02-04. ↑ Abrahamson, Alan (2003-12-06). "Judge Drops Olympic Bid Case". Los Angeles Times. Retrieved 2009-03-21. ↑ Rowlatt, Justin (2004-07-29). "Buying the Games". BBC. Retrieved 2009-04-16. ↑ Zinser, Lynn (2005-07-07). "London Wins 2012 Olympics New York Lags". The New York Times. Retrieved 2009-02-04. ↑ "Paris Mayor Slams London Tactics". Sporting Life. UK. Retrieved 2009-02-04. ↑ Berkes, Howard (2006-02-07). "How Turin got the Games". NPR. Retrieved 2009-02-04. ↑ 49.0 49.1 "The Olympic Symbols" (PDF). International Olympic Committee. Retrieved 2009-02-04. ↑ "The Olympic flame and the torch relay" (PDF). Olympic Museum. International Olympic Committee. 2007. p. 6. Retrieved 2009-02-04. ↑ Evans, R. J. (July 30, 2008). "10 Olympic Mascots: How Many Can You Remember?". Newsflavor. Retrieved 2009-05-02. ↑ 52.0 52.1 52.2 "Fact sheet: Opening Ceremony of the Summer Olympic Games" (PDF). International Olympic Committee. February 2008. Retrieved 2008-08-14. ↑ 53.0 53.1 53.2 "Fact sheet: Opening Ceremony of the Winter Olympic Games" (PDF). International Olympic Committee. February 2008. Retrieved 2008-08-14. ↑ 54.0 54.1 "The development of the Games – Between festival and tradition" (PDF). The Modern Olympic Games (PDF). International Olympic Committee. p. 5. Retrieved 2008-08-29. ↑ "Olympic Closing Ceremony Protocol". New Delhi Television. 2008-08-30. Retrieved 2008-09-10. ↑ "Closing Ceremony" (PDF). International Olympic Committee. 2002-01-31. Retrieved 2008-08-27. ↑ "The Olympic Flags and Emblem". The Vancouver Organizing Committee for the 2010 Olympic and Paralympic Winter Games. Retrieved 2009-02-10. ↑ "Olympic Games – the Medal Ceremonies" (registration required). Encyclopædia Britannica. Retrieved 2008-08-29. ↑ "Symbols and Traditions". USA Today. 1999-07-12. Retrieved 2008-08-29. ↑ "Wrestling". The Beijing Organizing Committee for the Games of the XXIX Olympiad. Retrieved 2009-03-25. ↑ "Sports". International Olympic Committee. Retrieved 2009-02-08. ↑ "Factsheet: The sessions" (PDF). International Olympic Committee. p. 1. Retrieved 2009-02-08. ↑ 64.0 64.1 "Factsheet: The sports on the Olympic programme". International Olympic Committee. February 2008. Archived from the original (PDF) on 26 April 2009. Retrieved 3 July 2012. ↑ "Jim Thorpe Biography". Biography.com. Retrieved 2009-02-09. ↑ Eassom 1994, pp. 120–123. ↑ Schantz, Otto. "The Olympic Ideal and the Winter Games Attitudes Towards the Olympic Winter Games in Olympic Discourses—from Coubertin to Samaranch" (PDF). Comité International Pierre De Coubertin. Retrieved on 13 September 2008. ↑ 69.0 69.1 "Amateurism". USA Today. Gannett Company, Inc. 1999-07-12. Retrieved 2009-02-09. ↑ Burns, John F. (1984-05-09). "Protests are Issue: Russians Charge 'Gross Flouting' of the Ideals of the Competition". The New York Times. 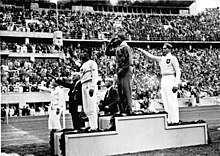 ↑ "1968: Black athletes make silent protest". BBC. 1968-10-17. Retrieved 2009-02-07. ↑ "Tom Hicks". Sports-reference.com. Retrieved 2009-01-30. ↑ Coile, Zachary (2005-04-27). "Bill Seeks to Toughen Drug Testing in Pro Sports". The San Francisco Chronicle. Retrieved 2008-09-03. ↑ "Olympic archive". Canadian Broadcasting Corporation. Retrieved 2008-08-29. ↑ "Olympic Park Bombing". CNN. Retrieved 2008-08-29. ↑ 81.0 81.1 "Olympic Charter" (PDF). International Olympic Committee. pp. 72–75. Archived from the original (PDF) on 28 July 2011. Retrieved 2 April 2009. ↑ 82.0 82.1 "Choice of the host city". International Olympic Committee. Retrieved 2009-04-02. Buchanon, Ian; Mallon, Bill (2006). Historical Dictionary of the Olympic Movement. Lanham, MD: Scarecrow Press. ISBN 0-8108-5574-7. Retrieved 2009-03-20. Cooper-Chen, Anne (2005). Global entertainment media. Mahwah, New Jersey: Lawrence Erlbaum Associates. ISBN 0-8058-5168-2. Retrieved 2009-03-21. 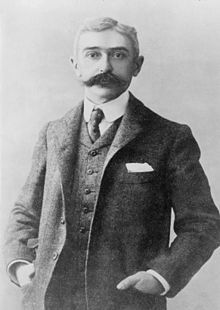 Coubertin, Pierre De (1897). The Olympic Games: BC 776 – AD 1896 (PDF). The Olympic Games in 1896 – Second Part. Philemon, Timoleon J.; Politis, N.G. ; Anninos, Charalambos. Athens: Charles Beck. Retrieved 2009-02-02. Darling, Janina K. (2004). "Panathenaic Stadium, Athens". Architecture of Greece. Santa Barbara, California: Greenwood Publishing Group. ISBN 0-313-32152-3. Retrieved 2009-01-30. Findling, John E.; Pelle, Kimberly D. (2004). Encyclopedia of the Modern Olympic Movement. Westport CT.: Greenwood Press. ISBN 0-313-32278-3. Retrieved 2009-03-30. Gershon, Richard A. (2000). Telecommunications Management:Industry structures and planning strategies. Mahwah, NJ: Lawrence Erlbaum Associates. ISBN 0-8058-3002-2. Retrieved 2009-03-21. "Olympic Charter" (PDF). International Olympic Committee. 2007. Retrieved 2009-02-12. Olympic Museum (2007). "The Olympic Games in Antiquity" (PDF). International Olympic Committee. Retrieved 2009-02-02. Pausanias (January 1, 1926). "Elis 1". Description of Greece. Loeb Classical Library. Vol. 2. translated by W. H. S. Jones and H. A. Ormerud. London: W. Heinemann. ISBN 0-674-99207-5. OCLC 10818363. Retrieved 2009-01-09. Pindar (1997). "Olympian 10". Olympian Odes. Loeb Classical Library. translated by William H. Race. Harvard University Press. ISBN 0-674-99564-3. Retrieved 2009-03-25. Porterfield, Jason (2008). Doping:Athletes and Drugs. New York: Rosen Publishing Group Inc. p. 15. ISBN 978-1-4042-1917-5. Retrieved 2009-01-30 – via Google Book Search. Roche, Maurice (2000). Mega-Events and Modernity. New York: Routledge, Taylor & Francis Group. ISBN 0-415-15711-0. Retrieved 2009-01-30. Schaffer, Kay; Smith, Sidonie (2000). Olympics at the Millennium. New Jersey: Rutgers University Press. ISBN 0-8135-2819-4. Retrieved 2009-01-30 – via Google Book Search. Slack, Trevor (2004). The Commercialisation of sport. New York: Routledge. ISBN 0-7146-8078-8. Retrieved 2009-03-31. Tomlinson, Alan (2005). Sport and leisure cultures. Minneapolis MN: University of Minnesota Press. ISBN 0-8166-3382-7. Retrieved 2009-04-02. Woods, Ron (2007). Social Issues in Sport. Champaign IL: Human Kinetics. ISBN 0-7360-5872-9. Retrieved 2009-04-02. Wikimedia Commons has media related to Olympic Games.